Grandfather said she would become guardian of this katana at age 16, as Yamatos have done for over 500 years. Monsters and gods, worlds of humans and spirits, from Japan to London to the depths of despair to first love – the katana connects them all to Mio as she struggles to master herself and the legendary blade’s powers. Glide into Mio’s no longer boring life by reading the first chapter here free (courtesy of the publisher). Yes, all 3 books of the trilogy are available in the US! Family secrets – what to share? Book info: Name of the Blade (Name of the Blade trilogy, book 1) / Zoe Marriott. Candlewick Press, 2014. [author site] [publisher site] Review copy and cover image courtesy of the publisher. and finally finding friends who don’t care? Have a hankie at hand when you read Abe’s determination to get the last word over the ALS that’s attacking his 17 year old body and his almost-too-late joy in meeting peers who look past his condition to help him when he needs it most. Read the first chapter free at the publisher’s website here (scroll down to Excerpt), then discover the rest of this Japanese teen’s story at your local library or favorite independent bookstore in hardcover or paperback. What would you do to help a friend? Book info: The Last Leaves Falling / Sarah Benwell (or Fox Benwell). Simon Schuster Books for Young Readers, 2015 (hardcover), 2016 (paperback) [author site] [publisher site] Review copy and cover image courtesy of the publisher. Why does he show up now?! Just as she’s leaving everything she loves, forever. Reading this took me back to my September visit to Tokyo – konbini convenience stores, punctual and safe metro, meeting near Hachiko statue at Shibuya. And just like Sophia, I had to move back to the States just before my senior year (not recommended by either of us). Happy book birthday to Seven Days of You ! Book info: Seven Days of You / Cecilia Vinesse. Poppy, 2017. [author site] [publisher site] Review copy and cover image courtesy of the publisher. With a week to pack up everything, say goodbye to best friends Mika and David, and re-experience her favorite things in Japan, 17-year-old Sophia gets more stressed with every second that clicks by on her countdown watch. And suddenly Jamie is here – still funny, still cute, still complicated. He’ll get to finish high school at Tokyo Academy with their friends from around the world, while she’ll be back in New Jersey with just Mom. Can time slow down for just this week? Can they heal their fractured relationship in just seven days? Can she leave him behind if they succeed? Her departure date hasn’t changed, but Sophia’s reasons for wanting to stay have multiplied in this contemporary story weaving together bitter and sweet. Shield of Kuromori, by Jason Rohan (book review) – save all or save her? Ninja colleague not yet recovered. Hero has to wonder who wins this time! Second in the Kuromori Chronicles, raising the stakes even higher for prophesied warrior Kenny, as the teen soccer player starts learning new sword skills and how to ID evil beings in the supernatural line-up just as the bad guys try to remove him from the picture entirely! After experiencing typhoon rains in Tokyo during my first week there, then an earthquake while waiting at the airport to leave, I can well imagine supernatural creatures below the earth or warring gods among the clouds! Still wondering… any yokai (evil or benign) where you live? Book info: Shield of Kuromori (Kuromori Chronicles, book 2) / Jason Rohan. Kane Miller, 2016. [series Facebook page] [publisher site] [distributor site] Review copy and cover image courtesy of the publisher. My book talk: A new threat to his adoptive land and his ninja partner’s growing anger keep Kenny jumping as the young hero foretold in Japanese prophecy strives to master supernatural warfare, stay away from school bullies, and keep Kiyomi calm enough to fight by his side. With Kiyomi’s behavior becoming more erratic, Kenny must decide whether to search for a way to cure her or to pursue the mysterious threat just uncovered by Japanese gods. Who is so unleashing so many evil yokai at once? Can two teenagers really save Japan from slow death? A mirror or a shield? Ancient Japanese stories, modern technology, and ages-old greed of man – all collide as Kiyomi and Kenny must unpuzzle this devious plot before evil wins the day. Follows The Sword of Kuromori in the series. Birth of Kitaro, by Shigeru Mizuki (book review) – Japanese supernatural Yokai! fighting evil beings in Japan! While I didn’t meet any (obvious) supernatural beings during my recent trip to Japan, I am delighted to share this first volume in a new English translation of Shigeru Mizuki’s Kitaro series. The Japanese manga master died in December 2015, leaving a legacy of yokai tales and other graphic novels, which Drawn & Quarterly is bringing to western readers. Visit the publisher’s page here to download a free excerpt of Kitaro’s adventures. Next book in the series arrives soon! Any supernatural folk in your neck of the woods? Book info: The Birth of Kitaro (Shigeru Mizuki’s Kitaro) / Shigeru Mizuki; text translated by Zack Davisson. Drawn & Quarterly, 2016. [artist’s obituary] [publisher site] Review copy and cover image courtesy of the publisher. My book talk: Fighting evil creatures is Kitaro’s specialty, but the one-eyed spirit boy and his eyeball-father aren’t always sure that the people of Japan are worth battling monstrous beings of legend. Single-eyed newborn Kitaro digs out of his mother’s grave and quickly finds himself embroiled in struggles with malicious yokai who want to overrun modern Japan. Can half-cat, half-girl Neko Mutsume help him outwit greedy Nezumi Otoko? How long will his late father’s spirit animate the eyeball? What’s the best way to banish a frightful buru-buru haunting the mountain highway? Kitaro’s wooden geta sandals clip-clop away from each supernatural encounter, and a letter in just the right forest postbox will always bring him back, as these 7 episodes from his earliest manga appearances show. First in a series, with new English text by Zack Davisson complementing manga master Shigeru Mizuki’s well-loved illustrations. dream visions and the end of the world? Kenny never dreamed that his granddad’s diplomatic work in post-war Japan would bring him face-to-face today with villains (human and otherwise) who try to keep the teen from stopping worldwide destruction. Check out the book’s Facebook page for a tour of sites and monsters found in book 1. I’m traveling in Japan this summer, so I will see torii gates and temples, but hope that I don’t encounter any nukekubi! Any multi-tailed foxes in your dreams? 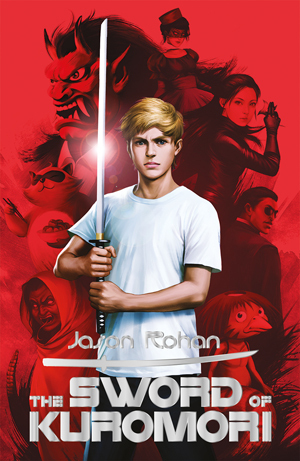 Book info: The Sword of Kuromori / Jason Rohan. Kane Miller, 2016. [series Facebook page] [publisher site] [author interview] Review copy and cover image courtesy of the publisher. My book talk: Kenny thinks he’ll finally meet up with his grieving father in Japan, but the British teen finds himself detained by government officials, rescued by his grandfather’s old allies, and expected to prevent the world’s destruction using a missing sword… in just nine days! His grandfather’s connections with Japan from decades past help Kenny locate the fabled sword that shares his last name so he can learn its secrets and tap into its powers, for he is the only one who can stop a slumbering dragon from being awoken to destroy the world – it is prophesied. Messages from spirit world allies arrive in his dreams, the daughter of grandfather’s old friend teaches him martial arts moves and essential Japanese phrases, and mythic beings try to kill them in broad daylight! Who exactly is threatening the USA west coast with a tsunami? How can an old sword stop an unearthly weapon? Will Kenny ever see his dad again? Stepdad knew their late father? Business trips were really what!? Is that black SUV still following us? When Claire discovers that her long-dead father was part of a Japanese organized crime gang, her whole world begins shaking – and here come the bad guys who want to make sure that the Utah teen goes under for good! If your local library or independent bookstore doesn’t have this summer 2015 release on the shelf, ask for it! Family secrets – key to one’s own history or ticking time-bomb? 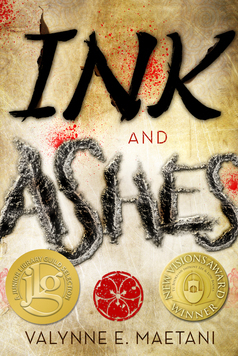 Book info: Ink and Ashes / Valynne E. Maetani. Tu Books, 2015. [author site] [publisher site] Review copy and cover image courtesy of the publisher. My book talk: Claire’s search for answers on the tenth anniversary of her father’s death inadvertently alerts the yakuza to her family’s location – and the race for survival is on! The letters that Claire wrote to Otochan in the years after his death appear throughout the book, as the straight-A student weathers accusations of cheating at school, uncovers many strange things about her late father, and must rely on her group of guy-friends more than ever when objects symbolizing death start arriving at her Utah home. Why would Mom lie about her father’s past? Why does the Japanese crime gang care about her family after all this time? Can she stay alive long enough to figure out Forrest? Did Mom’s doctor in Japan convince her to stop taking traditional cancer treatments? Why else would she have died just weeks before Danny’s graduation, her big goal during her five year fight? 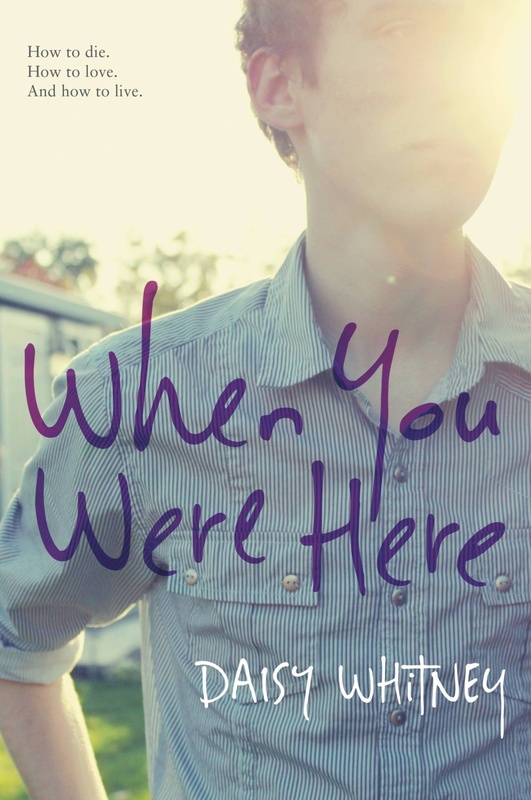 Book info: When You Were Here / Daisy Whitney. Little Brown Books for Young Readers, 2013 (paperback June 2014). [author’s Twitter] [publisher site] [author in Tokyo videos] Review copy and cover image courtesy of the publisher. My book talk: Bereft and angry, Danny travels to Tokyo after graduation, trying to discover why his mom gave up fighting her cancer just two months short of their shared goal. Even though she was a year older, Holland was perfect for Danny, but when she left for college last fall, she broke up with him, never giving a reason. His parents did business in Japan, Danny was born there, his dad died suddenly there six years ago. His mom spent her final cancer treatment time there, before returning home to enjoy the last days of her life. When the young woman who helped his mom in Tokyo asks Danny what’s to be done about Mom’s apartment there, he decides to leave the empty, memory-filled California house (and not-girlfriend-now Holland, home from college) to spend time in Japan and find out what changed his mother’s mind about holding on until he graduated.